Hulamin is committed to responsible environmental stewardship of its resources and to ensuring that all its activities result in minimal harm to the environment. Addressing environmental sustainability has thus far been integrated into the way Hulamin runs its business. Structural changes to the business were put in place to enable and sustain monitoring and reporting environmental sustainability alongside developing plans for continuous improvement, including the assessment of environmental risk. Aluminium smelters are heavily reliant on electricity, a scare and carbon-intensive resource, to produce primary aluminium. The mid- and downstream aluminium industries are reliant on this primary aluminium. This high utilisation of electricity by the smelters is therefore an indirect capital on which Hulamin is reliant. Hulamin also consumes electricity in its remelt, casting, rolling and extrusion activities. LPG gas and water are essential resources used in our production. Aluminium is infinitely recyclable. By recycling aluminium, the initial energy intensive process is eliminated. 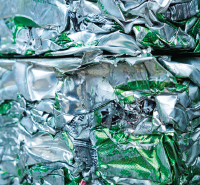 There is an increasing availability of aluminium scrap, including used beverage cans, in the local market. Recycling scrap creates prospects of improved economic returns for the mid- and downstream industry. Further, the collection and recycling industry creates additional employment. In addition, efforts are continuously being made to reduce consumption of energy resources through improved efficiencies and waste management. Every employee at Hulamin is tasked to help sustain our environment. This relates to minimising energy and water consumption and reducing waste to a minimum. To achieve this, we strive to operate as efficiently as possible. Environmental sustainability is driven by our Safety, Health and Environment Committee. Since we pledge to minimise our impact on the environment, we strictly monitor all waste leaving the plant, both effluent waters from our processes as well as solid waste streams. We have contracts with specialist third parties who assist us to manage these waste streams. We also have regular third party testing of our air emissions. We monitor legislative developments; the latest Waste Act has been reviewed by Hulamin to ensure that we comply with all new requirements. 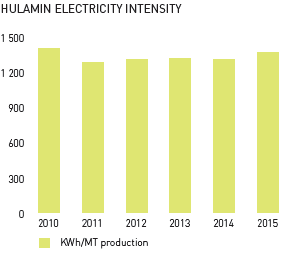 At the end of 2012, Hulamin set intensity targets for all key environmental parameters (consumption per unit ton produced). 2015 was a more challenging year given the pressures of electricity load curtailment and LPG shortages within the country. Although production continued, we have limited ability to reduce our base-load energy requirement. This made it difficult to reach the targets we had set ourselves. We do, however, believe that the targets are achievable and will continue to make efforts to reach the targets in 2016. During the course of 2015, Hulamin rolled out training of environmental sustainability reporting to our two subsidiary sites: Hulamin Midrand and Hulamin Containers. It is expected that they would be able to formally report their environmental sustainability data by the end of 2016. 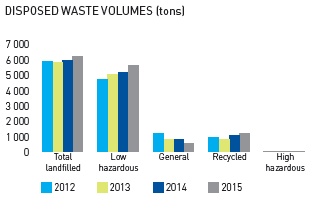 Since 2010, KPMG has assured the accuracy of the selected Environmental, Health and Safety data reported. Hulamin continues to track and monitor Greenhouse Gas (GHG) emissions. We have once again conducted our annual carbon footprint analysis in accordance with the Greenhouse Gas Protocol. While Hulamin has made some progress to improve energy efficiency over the last few years with improved measurement systems in place, Hulamin is now in a good position to formally implement an energy management system. Progress has been made through continued effort at the Camps Drift Remelt (CDR), our biggest LPG consuming department. Improved instrumentation and process control has led to a reduction in gas consumption on the first melter where the new control measures were put in place. 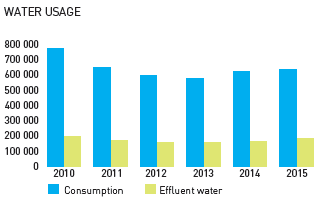 These reduced consumption numbers for the melter definitely impacted positively on the CO 2 emissions for the business2015 saw the initiation of a virtual natural gas (NG) pipeline being made available through the use of 200 GJ trailers by Spring Lights Gas between Umbogintwini and Pietermaritzburg. Hulamin has started the process of migrating our furnaces and ovens from LPG to NG with the first furnace being changed over in the first quarter of 2016. 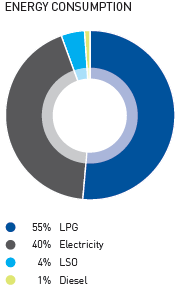 From an emissions perspective natural gas produces approximately 20% less CO 2 than LPG. An emergency diesel generator set of 6,3 MVA peak capacity was also installed during the first half of the year in order to minimise the effect of load curtailment on the plant performance. This capacity allows the plant to remain in full operation during 10% load curtailment conditions. An energy sourcing study was also commissioned in order to determine the medium to longer term sourcing strategy for Hulamin. The results of this study will be presented by during the first quarter of 2016. South Africa is a water scarce country and we recognise that our duty is to reduce and reuse this scarce resource in an efficient and sustainable manner. In recognising shortcomings in the area of water conservation at Hulamin, a water management team has been set up to identify and manage water concerns. The mandate of this team is to identify water risks, monitor and understand monthly consumption data and to develop action plans for risks and opportunities. During 2015 our water monitoring system was incorporated into the Hulamin Quality Information System (QIS) and has been active since October 2015. Presently consumption is monitored and reported once weekly at our incomers to our plant and cooling towers. These actions are aimed at early identification of material leaks that develop during plant operation, of which we had two instances during the year. Plans are underway to install meters and monitor consumption during 2016 of at least 90 percent of our consumers, so that savings opportunities can be identified and controlled within the manufacturing areas. See the online sustainability report for more detail on each of the aspects of natural capital. Note: Limited assurance has been obtained over the following as detailed in the sustainability report: direct energy consumption (gigajoules), indirect energy consumption (gigajoules), total carbon footprint (using Eskom electricity conversion factor), total effluent discharge, general waste disposed, low hazardous waste disposed, high hazardous waste disposed, solid waste recycled, total water consumption and number of environmental incidents. Note: Limited assurance has been obtained over the following as detailed in the sustainability report: direct energy consumption (gigajoules), indirect energy consumption (gigajoules), total carbon footprint (using Eskom electricity conversion factor), total effl uent discharge, general waste disposed, low hazardous waste disposed, high hazardous waste disposed, solid waste recycled, total water consumption and number of environmental incidents.